Whatever it is, this beneficial blend of essential oils can help clear your mind and tame your tummy. * Keep a little bottle in your purse or on-hand in your medicine cabinet! Mix up your blend in your bottle. When feeling nauseous, put a bit behind your ears, on your stomach, and on your temples. Breathe! 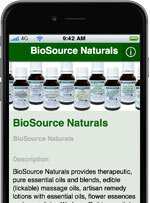 Discover Bio Source Naturals’ premium, specially priced essential oils collections here.